For the Earth-based experimental aircraft, see NASA Pathfinder. Official insignia of the Mars Pathfinder mission. Launched on December 4, 1996 by NASA aboard a Delta II booster a month after the Mars Global Surveyor was launched, it landed on July 4, 1997 on Mars's Ares Vallis, in a region called Chryse Planitia in the Oxia Palus quadrangle. The lander then opened, exposing the rover which conducted many experiments on the Martian surface. The mission carried a series of scientific instruments to analyze the Martian atmosphere, climate, geology and the composition of its rocks and soil. It was the second project from NASA's Discovery Program, which promotes the use of low-cost spacecraft and frequent launches under the motto "cheaper, faster and better" promoted by the then administrator, Daniel Goldin. The mission was directed by the Jet Propulsion Laboratory (JPL), a division of the California Institute of Technology, responsible for NASA's Mars Exploration Program. The project manager was JPL's Tony Spear. In addition to scientific objectives, the Mars Pathfinder mission was also a "proof-of-concept" for various technologies, such as airbag-mediated touchdown and automated obstacle avoidance, both later exploited by the Mars Exploration Rover mission. The Mars Pathfinder was also remarkable for its extremely low cost relative to other robotic space missions to Mars. Originally, the mission was conceived as the first of the Mars Environmental Survey (MESUR) program. To prove that the development of "faster, better and cheaper" spacecraft was possible (with three years for development and a cost under $150 million). To demonstrate NASA's commitment to low-cost planetary exploration by finishing the mission with a total expenditure of $280 million, including the launch vehicle and mission operations. The Mars Pathfinder conducted different investigations on the Martian soil using three scientific instruments. The lander contained a stereoscopic camera with spatial filters on an expandable pole called Imager for Mars Pathfinder (IMP), and the Atmospheric Structure Instrument/Meteorology Package (ASI/MET) which acts as a Mars meteorological station, collecting data about pressure, temperature, and winds. The MET structure included three windsocks mounted at three heights on a pole, the topmost at about one meter (yard) and generally registered winds from the West. The Sojourner rover had an Alpha Proton X-ray Spectrometer (APXS), which was used to analyze the components of the rocks and soil. The rover also had two black-and-white cameras and a color one. These instruments could investigate the geology of the Martian surface from just a few millimeters to many hundreds of meters, the geochemistry and evolutionary history of the rocks and surface, the magnetic and mechanical properties of the land, as well as the magnetic properties of the dust, atmosphere and the rotational and orbital dynamics of the planet. Three navigation cameras were on board the rover: Two black and white 0.3-megapixel cameras were located on the front (768 horizontal pixels × 484 vertical pixels configured in 4×4+100 pixel blocks), coupled with five laser stripe projectors, which enabled stereoscopic images to be taken along with measurements for hazard detection on the rover's path. A third camera with the same resolution but taking color images was located on the back, near the APXS, and rotated by 90°. It provided images of the APXS's target area and the rover's tracks on the ground. The pixels of this colour camera were arranged in such a way, that out of the 16 pixel of a 4×4 pixel block, 12 pixel were sensitive to green, 2 pixel to red and 2 pixel were sensitive to infrared as well as blue. As all cameras had lenses made out of zinc selenide, which blocks light below a wavelength of 500 nm, no blue light actually reached these "blue/infrared" pixels, which therefore recorded only infrared. All three cameras were CCDs manufactured by Eastman Kodak Company, and were controlled by the rover's CPU. They all had auto-exposure and capabilities for handling bad pixels, and the image parameters (exposure time, compression used, etc.) were included in the transmitted images as part of the image header. The rover could compress the front cameras' images using the block truncation coding (BTC) algorithm, but it could only do the same for the back camera's images if the colour information was discarded. The cameras' optical resolution was sufficient to resolve 0.6 cm details across a 0.65 m range. Mars Pathfinder entered the Martian atmosphere and landed using an innovative system involving an entry capsule, a supersonic parachute, followed by solid rockets and large airbags to cushion the impact. Mars Pathfinder directly entered Mars atmosphere in a retrograde direction from a hyperbolic trajectory at 6.1 km/s using an atmospheric entry aeroshell (capsule) that was derived from the original Viking Mars lander design. The aeroshell consisted of a back shell and a specially designed ablative heatshield to slow to 370 m/s (830 mph) where a supersonic disk-gap-band parachute was inflated to slow its descent through the thin Martian atmosphere to 68 m/s (about 160 mph). The lander's on-board computer used redundant on-board accelerometers to determine the timing of the parachute inflation. Twenty seconds later the heatshield was pyrotechnically released. Another twenty seconds later the lander was separated and lowered from the backshell on a 20 m bridle (tether). When the lander reached 1.6 km above the surface, a radar was used by the on-board computer to determine altitude and descent velocity. This information was used by the computer to determine the precise timing of the landing events that followed. Once the lander was 355 m above the ground, airbags were inflated in less than a second using three catalytically cooled solid rocket motors that served as gas generators. The airbags were made of 4 inter-connected multi-layer vectran bags that surrounded the tetrahedron lander. They were designed and tested to accommodate grazing angle impacts as high as 28 m/s. However, as the airbags were designed for no more than about 15 m/s vertical impacts, three solid retrorockets were mounted above the lander in the backshell. These were fired at 98 m above the ground. The lander's on-board computer estimated the best time to fire the rockets and cut the bridle so that the lander velocity would be reduced to about 0 m/s between 15 and 25 m above the ground. After 2.3 seconds, while the rockets were still firing, the lander cut the bridle loose about 21.5 m above the ground and fell to the ground. The rockets flew up and away with the backshell and parachute (they have since been sighted by orbital images). The lander impacted at 14 m/s and limited the impact to only 18 G of deceleration. The first bounce was 15.7 m high and continued bouncing for at least 15 additional bounces (accelerometer data recording did not continue through all of the bounces). The entire entry, descent and landing (EDL) process was completed in four minutes. Once the lander stopped rolling, the airbags deflated and retracted toward the lander using four winches mounted on the lander "petals". Designed to right itself from any initial orientation, the lander happened to roll right side up onto its base petal. 74 minutes after landing, the petals were deployed with Sojourner rover and the solar panels attached on the inside. The lander arrived at night at 2:56:55 Mars local solar time (16:56:55 UTC) on July 4, 1997. The lander had to wait until sunrise to send its first digital signals and images to Earth. The landing site was located at 19.30° north latitude and 33.52° west longitude in Ares Vallis, only 19 kilometres southwest of the center of the 200 km wide landing site ellipse. During Sol 1, the first Martian solar day the lander spent on the planet, the lander took pictures and made some meteorologic measurements. Once the data was received, the engineers realized that one of the airbags hadn't fully deflated and could be a problem for the forthcoming traverse of Sojourner's descent ramp. To solve the problem, they sent commands to the lander to raise one of its petals and perform additional retraction to flatten the airbag. The procedure was a success and on Sol 2, Sojourner was released, stood up and backed down one of two ramps. The Mars Pathfinder entry descent and landing system design was used (with some modification) on the Mars Exploration Rover mission. Likewise, many design aspects of the Sojourner rover (e.g. the rocker-bogie mobility architecture and the navigation algorithms) were also successfully used on the Mars Exploration Rover mission. 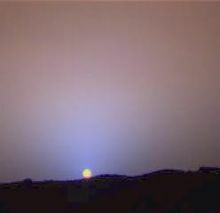 The Sojourner rover exit from the lander occurred on Sol 2, after its landing on July 4, 1997. As the next sols progressed it approached some rocks, which the scientists named "Barnacle Bill", "Yogi", and "Scooby-Doo", after famous cartoon characters. The rover made measurements of the elements found in those rocks and in the martian soil, while the lander took pictures of the Sojourner and the surrounding terrain, in addition to making climate observations. The first analysis on a rock started on Sol 3 with Barnacle Bill. The Alpha Particle X-ray Spectrometer (APXS) was used to determine its composition, the spectrometer taking ten hours to make a full scan of the sample. It found all the elements except hydrogen, which constitutes just 0.1 percent of the rock's or soil's mass. The APXS works by irradiating rocks and soil samples with alpha particles (helium nuclei, which consist of two protons and two neutrons). The results indicated that "Barnacle Bill" is much like Earth's andesites, confirming past volcanic activity. The discovery of andesites shows that some Martian rocks have been remelted and reprocessed. On Earth, Andesite forms when magma sits in pockets of rock while some of the iron and magnesium settle out. Consequently, the final rock contains less iron and magnesiums and more silica. Volcanic rocks are usually classified by comparing the relative amount of alkalis (Na2O and K2O) with the amount of silica (SiO2). Andesite is different from the rocks found in meteorites that have come from Mars. Analysis of the Yogi rock again using the APXS showed that it was a basaltic rock, more primitive than Barnacle Bill. Yogi's shape and texture show that it was probably deposited there by a flood. Another rock, named Moe, was found to have certain marks on its surface, demonstrating erosion caused by the wind. Most rocks analyzed showed a high content of silicon. In another region known as Rock Garden, Sojourner encountered crescent moon-shaped dunes, which are similar to crescentic dunes on Earth. The embedded computer on board the Sojourner rover was based around the 2 MHz Intel 80C85 CPU with 512 KB of RAM and 176 KB of flash memory solid-state storage, running a cyclic executive. 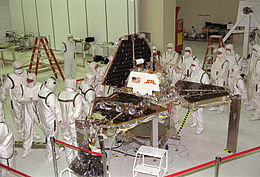 The computer of the Pathfinder lander was a Radiation Hardened IBM Risc 6000 Single Chip (Rad6000 SC) CPU with 128 MB of RAM and 6 MB of EEPROM and its operating system was VxWorks. The mission was jeopardised by a concurrent software bug in the lander, which had been found in preflight testing but was deemed a glitch and therefore given a low priority as it only occurred in certain unanticipated heavy-load conditions, and the focus was on verifying the entry and landing code. The problem, which was reproduced and corrected from Earth using a laboratory duplicate thanks to the logging and debugging functionality enabled in the flight software, was due to computer resets caused by priority inversion. No scientific or engineering data was lost after a computer reset, but all the following operations were interrupted until the next day. Four resets occurred (on July 5, 10, 11 and 14) during the mission, before patching the software on July 21 to enable priority inheritance. The lander sent more than 2.3 billion bits (287.5 megabytes) of information including 16,500 pictures and made 8.5 million measurements of the atmospheric pressure, temperature and wind speed. By taking multiple images of the sky at different distances from the Sun, scientists were able to determine that the size of the particles in the pink haze was about one micrometre in radius. The color of some soils was similar to that of an iron oxyhydroxide phase which would support the theory of a warmer and wetter climate in the past. Pathfinder carried a series of magnets to examine the magnetic component of the dust. Eventually, all but one of the magnets developed a coating of dust. Since the weakest magnet did not attract any soil, it was concluded that the airborne dust did not contain pure magnetite or just one type of maghemite. The dust probably was an aggregate possibly cemented with ferric oxide (Fe2O3). Using much more sophisticated instruments, Mars Spirit rover found that magnetite could explain the magnetic nature of the dust and soil on Mars. Magnetite was found in the soil and that the most magnetic part of the soil was dark. Magnetite is very dark. Using Doppler tracking and two-way ranging, scientists added earlier measurements from the Viking landers to determine that the non-hydrostatic component of the polar moment of inertia is due to the Tharsis bulge and that the interior is not melted. The central metallic core is between 1300 km and 2000 km in radius. Although the mission was planned to last from a week to a month, the rover operated successfully for almost three months. Communication failed after 7 October, with a final data transmission received from Pathfinder at 10:23 UTC on September 27, 1997. Mission managers tried to restore full communications during the following five months, but the mission was terminated on March 10, 1998. During the extended operation a high-resolution stereo panorama of the surrounding terrain was being made, and the Sojourner rover was to visit a distant ridge, but the panorama was only about one-third completed and the ridge visit had not begun when communication failed. The on-board battery—designed to operate for one month—may have failed after repeated charging and discharging. The battery was used to heat the probe's electronics to slightly above the expected nighttime temperatures on Mars. With the failure of the battery, colder-than-normal temperatures may have caused vital parts to break, leading to loss of communications. The mission had exceeded its goals in the first month. Mars Reconnaissance Orbiter spotted Pathfinder lander in January 2007 (left). Initiated in March 1994 by The Planetary Society of Pasadena, California, in cooperation with NASA's Jet Propulsion Laboratory (JPL), the contest got under way with an announcement in the January 1995 issue of the National Science Teachers Association's magazine Science and Children, circulated to 20,000 teachers and schools across the nation. The winning essay, which suggested naming the rover for Sojourner Truth, was selected from among 3,500 essays and was submitted by 12-year-old Valerie Ambroise of Bridgeport, CT. First runner-up was Deepti Rohatgi, 18, of Rockville, MD, who suggested Marie Curie. Second runner-up was Adam Sheedy, 15, of Round Rock, TX, who submitted the name of the late astronaut Judith Resnik, who perished in the 1986 Challenger space shuttle explosion. Other popular suggestions included Sacajewea and Amelia Earhart. In the 2000 film Red Planet, astronauts stranded on Mars make a makeshift radio from parts of Pathfinder, and use it to communicate with their spaceship. In the 2011 novel The Martian by Andy Weir, and its 2015 film adaptation, the protagonist, Mark Watney, who is stranded alone on Mars, travels to the long-dead Pathfinder site, (noting the "Twin Peaks" as a landmark in the novel), and returns it to his base in an attempt to communicate with Earth. ^ a b Nelson, Jon. "Mars Pathfinder / Sojourner Rover". NASA. Archived from the original on 2014-02-19. Retrieved February 2, 2014. ^ a b "Mars Pathfinder Fact Sheet". NASA/JPL. 19 March 2005. Archived from the original on 2014-09-19. Retrieved February 21, 2014. ^ Conway, Erik (2015). "The Discovery Program: Mars Pathfinder". Jet Propulsion Laboratory. Archived from the original on 2015-01-17. Retrieved June 10, 2015. ^ Sawyer, Kathy (November 13, 1993). "One Way or Another, Space Agency Will Hitch a Ride to Mars". Washington Post. Retrieved November 24, 2010. ^ "Mars Pathfinder". NASA. Archived from the original on 2011-11-12. Retrieved June 10, 2015. ^ Ezell, Edward Clinton; Ezell, Linda Neuman (1984). "Viking Lander: Building A Complex Spacecraft - Reorganizations and Additional Cutbacks". On Mars: Exploration of the Red Planet 1958-1978. Washington, D.C.: National Aeronautics and Space Administration. pp. 268–270. Archived from the original on 2016-04-08. Retrieved June 10, 2015. ^ Smith, P. H.; Tomasko, M. G.; Britt, D.; Crowe, D. G.; Reid, R.; Keller, H. U.; Thomas, N.; Gliem, F.; Rueffer, P.; Sullivan, R.; Greeley, R.; Knudsen, J. M.; Madsen, M. B.; Gunnlaugsson, H. P.; Hviid, S. F.; Goetz, W.; Soderblom, L. A.; Gaddis, L.; Kirk, R. (1997). "The imager for Mars Pathfinder experiment". Journal of Geophysical Research. 102 (E2): 4003–4026. Bibcode:1997JGR...102.4003S. doi:10.1029/96JE03568. ^ Smith P. H.; Bell J. F.; Bridges N. T. (1997). "Results from the Mars Pathfinder camera". Science. 278 (5344): 1758–1765. Bibcode:1997Sci...278.1758S. doi:10.1126/science.278.5344.1758. PMID 9388170. ^ Schofield J. T.; Barnes J. R.; Crisp D.; Haberle R. M.; Larsen S.; Magalhaes J. A.; Murphy J. R.; Seiff A.; Wilson G. (1997). "The Mars Pathfinder atmospheric structure investigation meteorology (ASI/MET) experiment". Science. 278 (5344): 1752–1758. Bibcode:1997Sci...278.1752S. doi:10.1126/science.278.5344.1752. PMID 9388169. ^ "Windsocks on Mars". JPL/NASA Mars Pathfinder. 2005. Archived from the original on 2016-03-05. Retrieved June 10, 2015. ^ R. Rieder; H. Wänke; T. Economou; A. Turkevich (1997). "Determination of the chemical composition of Martian soil and rocks: The alpha proton X ray spectrometer". Journal of Geophysical Research. 102: 4027–4044. Bibcode:1997JGR...102.4027R. doi:10.1029/96JE03918. ^ a b "Rover Camera Instrument Description". NASA. Archived from the original on 2016-03-05. Retrieved June 10, 2015. ^ "Mars Pathfinder Science Results". NASA. Archived from the original on 2008-09-20. Retrieved 2008-06-09. ^ "Mars lander renamed for Sagan". NASA. Archived from the original on 2018-12-11. Retrieved 5 September 2017. ^ "Entry Descent and Landing". JPL/NASA Mars Pathfinder. 2005. Archived from the original on 2012-06-01. Retrieved June 10, 2015. ^ "Mars – the search for life" (PDF). NASA. March 4, 2009. Archived from the original (PDF) on 2009-03-27. Retrieved March 28, 2009. ^ a b "APXS Composition Results". NASA. Archived from the original on 2016-06-03. Retrieved June 10, 2015. ^ a b Bruckner, J.; Dreibus, G.; Rieder, R.; Wanke, H. (2001). "Revised Data of the Mars Pathfinder Alpha Proton X-ray spectrometer: Geochemical Behavior of Major and Minor Elements". Lunar and Planetary Science XXXII. ^ "Mars Pathfinder FAQs - Sojourner CPU". NASA. Archived from the original on 2014-12-29. Retrieved June 10, 2015. ^ Bajracharya, Max; Maimone, Mark W.; Helmick, Daniel (December 2008). "Autonomy for Mars rovers: past, present, and future" (PDF). Computer. IEEE Computer Society. 41 (12): 44–50. ISSN 0018-9162. Archived (PDF) from the original on 2016-03-04. Retrieved 2015-06-10. ^ ""QUESTION: What type of computer is the Pathfinder utilizing? ..." (NASA Quest Q&A)". NASA. 1997. Archived from the original on 2016-03-07. Retrieved July 21, 2015. ^ ""QUESTION: When it was designed, why was only a single 80C85 CPU used? ..." (NASA Quest Q&A)". NASA. 1997. Archived from the original on 2015-07-23. Retrieved July 21, 2015. ^ "Wind River Powers Mars Exploration Rovers—Continues Legacy as Technology Provider for NASA's Space Exploration". Wind River Systems. June 6, 2003. Archived from the original on 2010-01-06. Retrieved August 28, 2009. ^ Reeves, Glenn E. (December 15, 1997). "What really happened on Mars? - Authoritative Account". Microsoft.com. Archived from the original on 2015-06-11. Retrieved 10 June 2015. ^ Jones, Michael B. (December 16, 1997). "What really happened on Mars?". Microsoft.com. Archived from the original on 2015-06-12. Retrieved June 10, 2015. ^ "The Mars Pathfinder Mission Status Reports — Second Week". Office of the Flight Operations Manager – Mars Pathfinder Project. Archived from the original on 2016-01-04. Retrieved 2015-10-24. ^ "The Mars Pathfinder Mission Status Reports — Third Week". Office of the Flight Operations Manager – Mars Pathfinder Project. Archived from the original on 2016-04-10. Retrieved 2015-10-24. ^ "Mars Pathfinder and Sojourner". NASA. Archived from the original on 2015-06-23. Retrieved June 10, 2015. ^ Hviid, S. et al. 1997. "Magnetic Properties Experiments on the Mars Pathfinder Lander: Preliminary Results". Science:278. 1768–1770. ^ Bertelsen, P. et al. 2004. "Magnetic Properties Experiments on the Mars Exploration rover Spirit at Gusev Crater". Science: 305. 827–829. ^ a b c "Mars Pathfinder Nearing Its End". sciencemag.org. Archived from the original on 2013-06-21. Retrieved June 10, 2015. ^ "NASA facts - Mars Pathfinder" (PDF). Archived (PDF) from the original on 2013-05-13. Retrieved 2013-09-30. ^ McKee, Maggie (January 12, 2007). "Mars probe may have spotted lost rover". New Scientist. Archived from the original on 2015-04-24. Retrieved 2017-09-04. ^ "Mars Pathfinder Landing Site and Surroundings". NASA. Archived from the original on 2015-05-20. Retrieved June 10, 2015. ^ "NASA Names First Rover to Explore the Surface of Mars". NASA. Archived from the original on 2011-06-07. Retrieved November 29, 2010. ^ "Pathfinder Rover Gets Its Name". NASA. Archived from the original on 2015-05-27. Retrieved June 10, 2015. ^ "Division Activity at Recent Meetings" (PDF). Planetary Geology Division Newsletter. 16 (1): 1. 1997. Archived from the original (– Scholar search) on June 8, 2011. ^ Weir, Andy (2014). The Martian. New York: Crown Publishers. ISBN 978-0-8041-3902-1. This article draws heavily on the corresponding article in the Spanish-language Wikipedia, which was accessed in the version of March 28, 2005. Deep Space Chronicle: A Chronology of Deep Space and Planetary Probes 1958–2000, Asif A. Siddiqi. Monographs in Aerospace History, #24. June 2002, NASA History Office. "Return to Mars", article by William R. Newcott. National Geographic, pp. 2–29. Vol. 194, 2nd edition – August 1998. "La misión Pathfinder –rebautizada Carl Sagan Memorial Station, en memoria del célebre astrónomo-, paso a paso todo Marte", de J. Roberto Mallo. Conozca Más, págs. 90–96. Edición número 106 – agosto de 1997. "Un espía que anda por Marte", de Julio Guerrieri. Descubrir, págs. 80–83. Edición número 73 – agosto de 1997. Experiences with operations and autonomy of the Mars Pathfinder microrover, A. H. Mishkin, J. C. Morrison, T. T. Nguyen, H. W. Stone, B. K. Cooper and B. H. Wilcox. In Proceedings of the IEEE Aerospace Conference, Snowmass, CO 1998. Wikimedia Commons has media related to Mars Pathfinder. Mars Pathfinder 360 View (released February 26, 2016). Super-Resolution Stereo Pairs of "Twin Peaks"